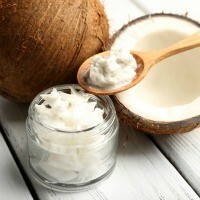 Coconut oil was previously branded as a "bad fat", as it contains saturated fatty acids. Recent studies have shown that the natural sources of saturated fat are not actually "bad", but they are useful, particularly for the brain. A new study, conducted at the Postgraduate Program in Cardiology at the School of Medicine, Universidade Federal do Rio de Janeiro, he has evaluated the health effects of extra virgin coconut. The study focused primarily on how coconut oil influence HDL cholesterol and a series of other measures, such as body weight, waist circumference ... The participants all were hypertensive, 63.2% of male, aged from 54 to 70 years. 94.5% had a blood lipid profile that indicated dyslipidemia and had been taking cholesterol-lowering drugs standard. For the first three months, 136 participants were made to follow a standard diet. For the third month and the subsequent, the 116 who had completed the first stage were placed in two intervention groups. The first group contained 22 participants who maintained the same diet. The remaining 92 were put on a diet and gave them 13 ml extra virgin coconut oil a day (equivalent to about a tablespoon). The results at the end of the three months have shown that the group of participants who had taken coconut oil, had a reduction of all six physical parameters measured, including the weight (mean reduction of 6 kg), body mass (mean reduction 2 kg), waist circumference (average reduction of 2.1 cm), the perimeter of the neck (average reduction of 4 cm), systolic blood pressure (mean reduction of 3.3 points), diastolic blood pressure ( average reduction of 3.5 points). The participants also had an increase of 3.1 to 7.4 mg of cholesterol HDL. The researchers concluded that "Our study has shown that a diet rich in extra virgin coconut seems to favor the reduction of numerous risk parameters and increased concentrations of HDL-C, thus promoting prevention in patients with hypertensive"